Need to make a quick and simple card? 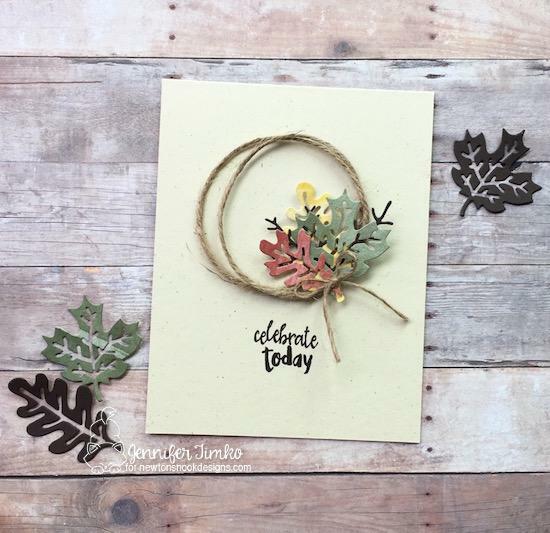 Today Jennifer is sharing a fun way to create a quick card for Fall! She used those pretty leaves from our Autumn Leaves Die Set and die cut them with different colored papers. She then took a cluster of them and added them onto her card with a piece of burlap twine to create an elegant and simple wreath. Another cool think about this die set is that you can take the inside part of the leaf that is created with the die cut and use it as an extra branches too. She did that with a couple of the dark brown leaves. To finish off the card, she added the "celebrate today" sentiment from the Happy Little Thoughts Stamp Set. This creates such a lovely card and one that you could easily make a bunch of!